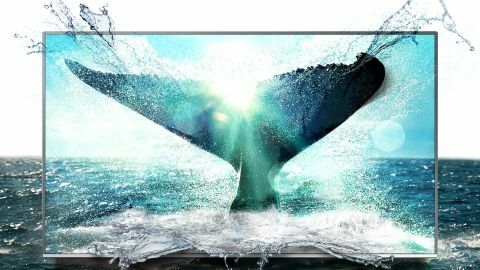 The UN55KS9000 continues Samsung’s dedicated pursuit of the ultimate HDR experience with its high brightness and powerful color technologies. There are one or two stumbles along the way, but overall no other TV range around today offers the same level of HDR excitement for so little cash. The UN55KS9000’s headline attraction is that it has all the specifications necessary to deliver - on paper, anyway - a genuinely premium high dynamic range experience for a mid-range price. These specifications include a high brightness output of beyond 1000 nits and a huge color range delivered by Quantum Dot technology that covers more than 90% of digital cinema’s DCI-P3 standard. The UN55KS9000 differs from the models that sit below it by supporting more localized controls of its edge LED lighting system and slightly more powerful motion processing. Samsung has sensibly stepped away with the UN55KS9000 from the chunky design of many of its 2015 TVs in favor of a slimmer, more minimalist look. The narrowness of the screen frame is echoed by a slender rear that stands in stark and, for us, welcome contrast to the extended depth created by Samsung’s curved TVs. The addition of a gleaming metallic trim and centrally mounted polished aluminum desktop stand creates a really premium feel, too. The UN55KS9000’s connectivity is mostly strong, with highlights of four HDMIs, three USBs, and Wi-Fi network connectivity. The only disappointment is that the only headphone connection option is Bluetooth. Samsung’s latest Tizen-based Smart TVs make it much easier than their predecessors did to quickly get to interesting content. This is because it introduces a new second deck of contextual content link icons above the original deck introduced in 2015. Available apps are headlined by 4K and HDR versions of Amazon and Netflix, YouTube, Hulu and Playstation Now. At the heart of the UN55KS9000’s considerable SDR thrills is a superb black level response. Dark scenes benefit from black colors that actually look black - especially if you use the local dimming system that lets different segments of the TV’s edge-mounted LEDs deliver different amounts of light. What’s more, in SDR mode this localized LED control causes hardly any unwanted light pollution around bright objects, even when those bright objects appear against near-black backdrops. This is a rare accomplishment in the edge-lit LED world. The excellent black levels aren’t achieved at the expense of shadow detailing, and contribute to a terrifically rich color performance. This richness is joined by gorgeously subtle color toning, which helps to emphasize the clarity of one of the sharpest, most detailed UHD images I’ve seen. While the UN55KS9000 is at its best with native UHD sources, it’s no slouch at upscaling HD. Blu-rays and HD broadcasts enjoy a clear sharpness boost while simultaneously having inherent noise magically removed. All that said, just avoid setting the TV’s sharpness higher than around 25 with upscaled HD if you don’t want areas of fine detail starting to ‘glow’. Every other aspect is noteworthy, but it’s with HDR that the UN55KS9000 most makes its mark. Particularly effective is its ability to hit brightness peaks above the 1000 nit level used when mastering most current HDR sources. This instantly ‘sells’ the impact of HDR versus SDR, and helps Samsung’s TV resolve subtle tonal detailing in the brightest areas that ‘flares out’ on less bright TVs. The UN55KS9000 also does a stellar job of delivering the wide color ranges that are part of the Ultra HD Blu-ray HDR experience, with this richness holding up during dark scenes better than usual with LCD TVs, too. The UN55KS9000 isn’t only good, though, at showing off the most dynamic aspects of HDR and wide color gamut sources. It’s also got enough finesse in its HDR toning to handle less explosive image areas like skin and cloudy skies with real sensitivity and naturalism. The huge range of color tones available to the UN55KS9000 in HDR mode joins forces with the native UHD resolution to deliver superbly detailed images. The only thing that reduces the clarity is some fairly pronounced motion judder when showing 4K content, and some color banding in HDR skies. Despite its enviably trim bodywork, the UN55KS9000 produces a pretty potent, expansive audio performance. In a perfect world there’d be more bass to flesh out explosions, gun fire and the like. But perfect sound and very thin TVs seldom go together, and by the standards of thin TVs generally the UN55KS9000’s audio is well above average. The UN55KS9000 sets the right tone immediately with its trim, glamorous design, and builds on that with a killer combination of a Tizen-driven smart TV system, a native UHD resolution and high dynamic range playback. Its pictures deliver on this HDR potential with levels of brightness and color you just don’t get anywhere else for the same money - though it’s a star with standard dynamic range, too.There is a price to pay for such dynamic pictures in the appearance of some backlight clouding flaws during dark HDR scenes, but in the end the pros far outweigh the cons.